3 world title fights by Top Rank will be held at the Bank of America Center, Corpus Christi, Texas, USA. Jerwin Ancajas, Gilberto Ramirez and Raymundo Beltran is schedule for a blockbuster event on Febuary 3, 2018. The Filipino 25 years old Jerwin Ancajas will defend his IBF World Super Flyweight Title against Israel Gonzalez of Mexico. Both fighters will fight in the US for the first time. 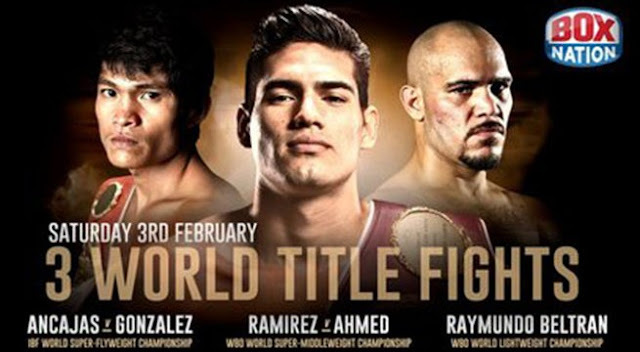 WBO World Super Middleweight champion Gilberto Ramirez of Mexico to fight Habib Ahmed from Ghana. Both fighters are undefeated with a high KO percentage. Raymundo Beltran will fight for the vacant WBO World Lightweight Title against yet to be named opponent. Beltran won his last fight against Bryan Vazquez via majority decision last August 2017. Fight will be telecast live via ESPN on Feburary 3, 2018.